Saint Anthony of Padua; Who Was He? Secular Franciscan Order; Who Are We? 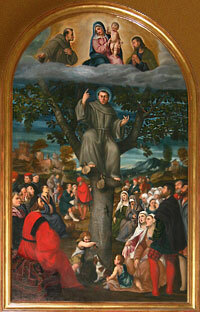 St. Francis of Assisi, Who Was He? In the Scriptures for this past Sunday, we read from the Book of Wisdom, that God creates life, only life. He meant for humanity to be immortal. It is only because humanity allowed evil into its hearts, that death came in. In the reading from the Gospel of Mark; we see Jesus as the source of healing and life. A woman needed only to touch his cloak, and she was healed of her illness. Jesus restores a little child to life. And he will, by his death and resurrection, will free all from the power of death. But death can take many forms. There is physical death, and then is the slow death of one’s spirit, one’s soul. Sometimes, the harsh circumstances of life can grind us down. So much so, that we begin to to feel dead inside to the beauty of creation; the love of others; the love of God. It is in moments like this, that we need to turn to Jesus, through Word and Sacrament; through prayer and meditation. In encountering Jesus Christ, we encounter the healer, both of body and soul. Now this does may not mean an instantaneous healing. But if we remain open to the Spirit of Christ, working within us; we may feel a little more peace, a little more hope. And a new dawn will break open for us. All are welcome here. I hope you will find my random thoughts, reflections, and bits of news interesting. I write from a Franciscan and deacon's viewpoint about our Church, our country and our world. Any feedback, comments and criticisms are welcomed, but please, no slander, profanity, name-calling, racism or sexism. I reserve the right to delete any violations. Franciscan charity and compassion will be our guide. A Roman Catholic deacon trying to live a life of self emptying in an age of self actualization. The ongoing quest for that all-important, ever-present something-or-other….